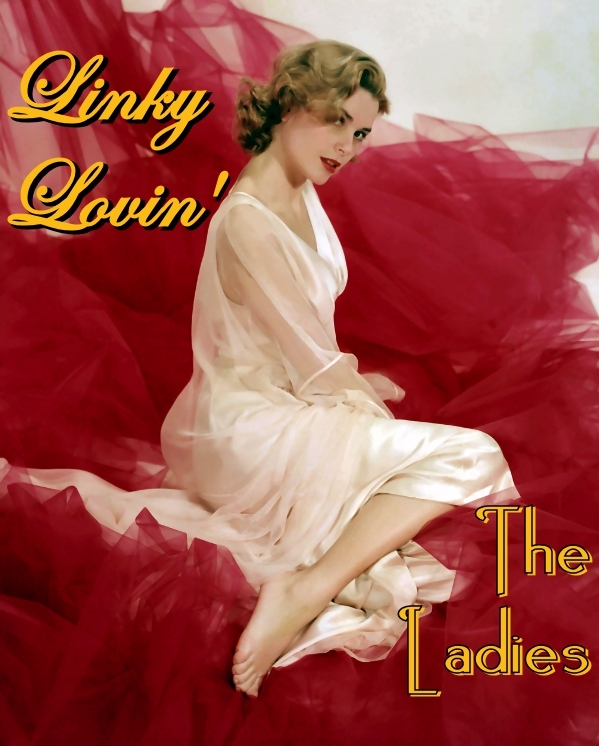 Linky Lovin’ The Ladies: 05 September 2011 A.D.
-A wise man [me] once said: ‘If you want to see what’s down the road for America, look to Great Britain’. Pundette looks across the pond and sees something that should scare the bejesus out of all of us. As for me: I looked over Jordan and what did I see-ee….Mrs. Jordan. -Over at Eastern Rite, Karen has published a righteous rant on how people have accepted the Left’s mutated definition of the word ‘free’ — can you say, ‘denying Reality’? -Lady LoopyLoo has the transcript of Sarah Palin’s speech Saturday in Iowa and I think it’s a humdinger — just like Lady Loo. -Roving street gangs in the forests of Wisconsin! Over at the Bluebird Of Bitterness, bob has the shocking details – if you can bear it. Also, check out this cute story she tells about a couple in their eighties that gave me a good laugh. -Pat Austin takes on Teamsters President, Comrade Jimmy Hoffa, and I don’t have to tell you which one of them will have to seek treatment. BTW, my new chant: SOB TEA. -I meant to post about this a couple of weeks ago, but it got lost in the confusion that is my link file: Over at Carol’s Closet, Carol takes on one Jared Bernstein. She describes his words as ‘sinister’, but I think the Bolshe is a menace. -Tere, of Teresamerica fame, has an excellent post up over at Catholibertarian that makes the well-reasoned case for laws that require women, thinking of getting abortions, be shown an ultrasound of the baby in their wombs before they can have the procedure. -Over at the Frugal Cafe, Vicki is serving up some black conservatives who are fighting the noble fight against the plantation-loving Left [ie: all of them]. -Zilla is putting up a valiant resistance against those who refuse to see the ‘green job’s scandal for what it is. -Kathy Shaidle never, ever, pulls her punches and Thank The Good Lord for that. Here she says what should have been shouted in public about Chastity Bono all along. A is A, ya all. -No LLTL would be complete without a link to the sweetest gal in The Blogosphere: Amusing Bunni. She reports on her visit to a Cat Circus and, per usual, has plenty of video, including a performance by Tuna And The RockCats. Bunni was inspired by the show and is now trying to teach her cat, Kittehkins, some of the tricks, but the best thing of all is that, if she’s successful, she may show off the tricks while wearing a Cat Woman costume! I’m purring already. -Well that’s about it for this time around. To all the gals we didn’t get to: don’t worry, this is going to be a semi-regular feature here at TCOTS — we’ll eventually get around to all you wonderful ladies. So many ladies, so little time — that’s been the story of my whole life…ah, well…. Keep those card and letter coming. Thank you Bobby, you make me blush with such compliments! As long as I don’t make the bloom come off the rose. I can feel the vibes….or is that another earthquake? Hi Bob, you are too sweet and kind! I’m in such great company here. Although I’ve never given birth, I do have a darling little one in the adorable Kittehkins 😉 I doubt I”ll ever get her well trained, but it’s only been a few months since I rescued her from the shelter. At this point, SHE’s training ME! Hee hee. I’m glad you enjoyed the Cat Circus, and also thanks to ClassicFilm for the summary! I’ve never given birth either [well, as far as I know, cause parts of the ’80’s are a bit of a blur], but it didn’t stop me from celebrating! I’m still trying to train our kitten, Scout, and, like you, I think she’s training me and Mrs. B. Thanks for the linky-love, Bob! I am honored to be in such good company! You’re very welcome….now come down off that branch! You are awesome and so cool, Bob. Thank you for the linky-love. Have a wonderful day! I’m like chocolate chip ice cream. So, now we’re the new pin-up girls? hahaha Sharin the love! Thanks, Bob! Well…you gals could be the new Rule 5 gals if you send in some snaps.